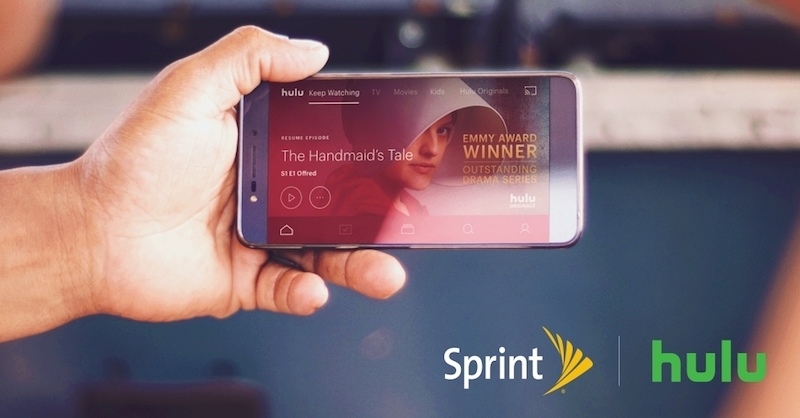 Sprint and Hulu today announced a partnership that will bundle the Limited Commercials tier of the streaming TV service into Sprint's Unlimited Freedom cellular plan. This means that new and existing Sprint customers who sign up for Unlimited Freedom beginning Friday, November 17 will be able to watch Hulu with Limited Commercials at no extra cost. In addition, the companies said that sometime "soon" Sprint Unlimited customers will also get to upgrade to Hulu's sports and news-centric live TV plan. Because Hulu with Live TV costs far more than the Limited Commercials plan ($40/month versus $8/month), an added cost for the bundled-in service is likely. Sprint Unlimited Freedom offers unlimited talk, text, and data for $25/month per line and the addition of a fifth line is free on every plan, amounting to $100/month for a family of five people. This discounted offer lasts until January 31, 2019 and at that time will increase to $60/month for line 1, $40/month for line 2, and $30/month/line for lines 3-5. There's also HD streaming video and an included 10GB mobile hotspot feature. For more information on the collaboration between Sprint and Hulu, visit the carrier's website right here. Those interested will be able to gain access to the offer starting November 17, and it'll only be available online through December 8. The Sprint/Hulu partnership is similar to an announcement made by T-Mobile and Netflix in September, when the companies announced that T-Mobile ONE family plans would start coming with free Netflix subscriptions later that month. "Netflix on Us" requires customers to have two or more paid voice lines on a T-Mobile ONE family plan, and if they already pay for a Netflix subscription, the un-carrier covers the cost of the standard $10/month price: "meaning you’ll save nearly $120 every year." Does that apply to T-Mobile also when their network is unusable? Are you able to watch Netflix for free on a TV or does it only apply to your mobile ? I wouldn't get either Sprint or T-Mobile if you want actual coverage. Where do you live that T-Mobile is so terrible? Or are you referring to 2014 T-Mobile that was actually terrible? You won't be able to make a call, but you'll be able to watch Hulu on your TV. People watch shows on their smartphones? People who take public transit do, by the millions. Yes. I'm a night owl, and frequently enjoy watching movies and shows on my iPhone with headphones in, after everyone else in the house has gone to sleep. Basically, holding it right up in front of my face makes it the perfect personal "big-screen" TV. Seriously?? Just how cozy it is that rock you’ve been sleeping under? People have been doing that for years and years. Particularly commuters and travelers. If Sprint and Verizon were the same cost, i would choose Verizon. But having Sprint means I have about and extra $50 a month for other things. The difference in network quality that I have experienced isn’t even with $5 to me.